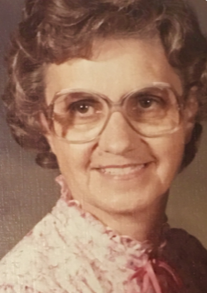 Age 93, of South Webster, passed away Saturday March 30, 2019, at Best Care Convalescent Center. She was born May 8, 1925 in South Portsmouth, KY, a daughter of the late Sidney and Mary (McMeans) Bailey. She was a member of South Webster Christ United Methodist Church and was very active in the church. She was an avid reader, loved to cook, and loved to spend time with her grandchildren. Dot is survived by two sons, Timothy Horner and wife Nancy of Ashley Corner and David L. Horner and wife Jeri of South Webster; five grandchildren; and eight great-grandchildren. She was also preceded in death by her husband Robert Horner in March of 1997 and two brothers, Charles and Dale Bailey. The family would like to thank Best Care Nursing and Rehabilitation Center for the love and care they gave Dot during her stay. Funeral services will be 11:00 a.m. Tuesday April 2, 2019 at D.W. SWICK-NELSON FUNERAL HOME in South Webster with Pastor Sam Peters officiating. Interment will follow at South Webster Cemetery. Visitation will be 5 to 7 p.m. Monday April 1, 2019 and Tuesday 10 to 11 a.m. at the funeral home. In lieu of flowers, the family asks that donations be made in Dot’s name to South Webster Christ United Methodist Church. Fond memories and expressions of condolence may be shared at www.DWSwickNelsonFuneralHome.com.